Spinnaker pole, reaching strut and rigid vang. 220 volt, 6 batteries charged by: engine, solar panels, shore power, generator House battery bank is 4 x 90 amp/hr AGM sealed batteries for a total of 540 amp hours. Engine starting bank is 2 x 750 Cold Cranking Amps (CCA) sealed maintenance free batteries. Reserve capacity of 2 x 90 amp/hr for a total of 180 amp hours. Main engine is outfitted with two independent alternators, one for each battery bank. 240Vac single cylinder diesel generator in the lazarette. 2 x 65W Solar panels. 220 - 240V shore power and 2kW inverter/charger. The stb'd side cabin is currently used as a workshop/store. 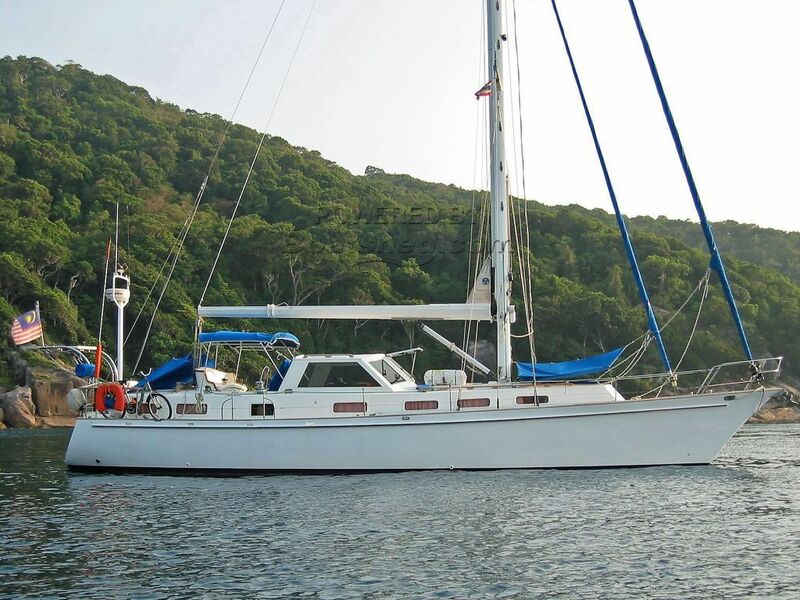 A solidly built comfortable, blue water, cruising yacht, the hull was built in NZ by Goodwins and she was fitted out and rigged by Salthouse Brothers to an Alan Wright design. The current owners have cruised the Pacific and SE Asia, with visits to such locales as Fiji, Hawaii, Borneo, Thailand, and many more. Down below she is laid out with very spacious master cabin aft, V-berth cabin for'd, stb'd side twin bunk cabin, plus an additional pilot berth in the aft cabin passageway, 2 heads, U-shaped settee salon with reverse cycle A/C (cooling & heating) plus a nav station and generous galley. She has ample storage, with the stb'd side cabin currently used as a workshop / store. Her bright and stylish interior boasts solid hardwood cabinetry and bulkheads. Light-colored furnishings and headliners and good headroom throughout making this boat very livable and a great cruising boat for a couple with kids or occasional guests. Her extra strong hull has a fully encapsulated fin keel and a skeg hung rudder and sails and rigging all appear to be in good condition. She presents very nicely with little or no work necessary to go sailing. Equipped with all furling sails she can be sailed short handed without having to leave the safety of the cockpit. This Oceans 14 Cutter has been personally photographed and viewed by Alan Giles of Boatshed Langkawi. Click here for contact details.